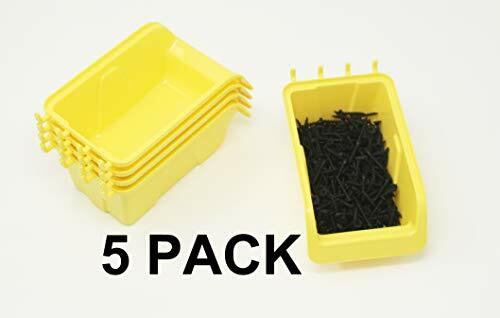 FIVE YELLOW storage bins. great for organizing small items.Features : Made in the USA Fits all standard ¼ inch pegboard. Easy to install, easy to move and stays in place. Better built. Our design holds the heaviest items easily. JSP Manufacturing Pegboard Bin for workshops, Craft Rooms, garages and sheds, Collecting, Organizing. Perfect for organizing accessories and small parts such as, screws, washers, nuts, bolts, nails, clips and and craft items such as tools, beads, sewing, crafting pieces.